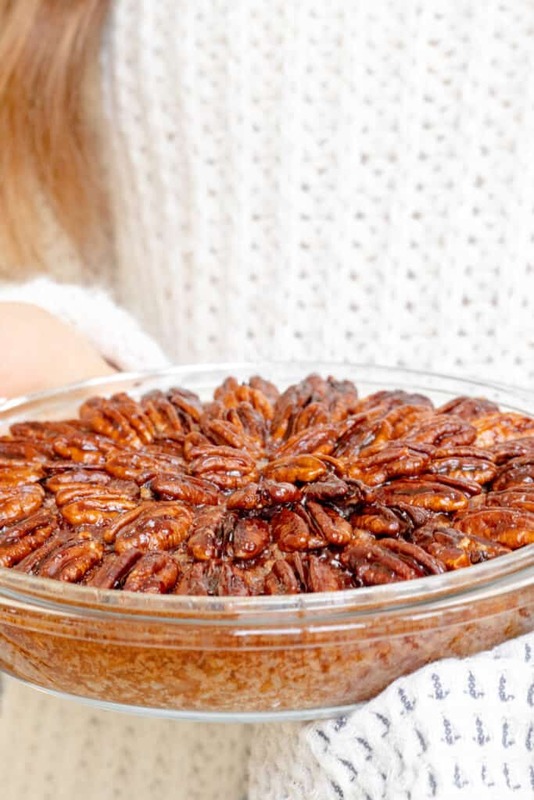 Just when I thought I couldn’t get anymore obsessed with porridge, I made this Pecan Pie Baked Oatmeal. Life = changed. Baked porridge, baked oats, baked oatmeal… call it what you please. I’ve seen a few baked oat recipes floating round the internet lately. 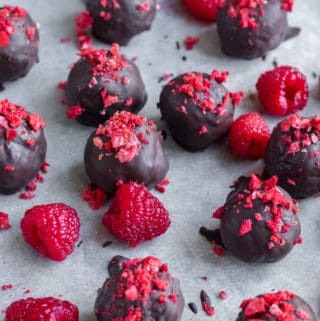 I’ve been reluctant to try them because I just couldn’t imagine it being particularly yummy. ‘Stodgy’ and ‘dry’ were words that came to mind. Woah, how I was wrong. Sweet, soft and cake like – more comparable to dessert than to breakfast. Mind blown. I thought, what better way to celebrate my discovery than to combine it with one of my favourite desserts? Whola! 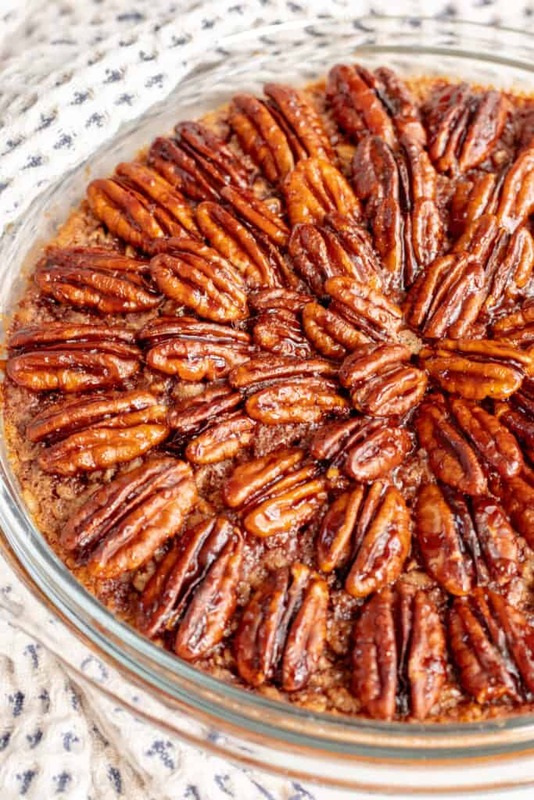 Pecan pie baked oatmeal was born. This is the perfect weekend breakfast. Pop it in the oven whilst you jump in the shower and come downstairs to the most delicious scent and most delectable breakfast. 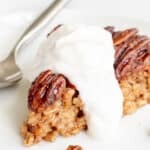 This pecan pie baked oatmeal does look rather fancy, but by no means do you need to spend your morning arranging the nuts as I have, pouring them over the top works just the same. Well, yes! Oats are a fantastic choice for breakfast as they are full of slow-releasing carbohydrates and contain plenty of fibre. You will find lots of protein hidden in the pecans and egg, with the healthy fats from the coconut oil keeping you fuller for longer. Combine with sweetness coming from maple syrup (has a lower glycemic index than regular sugar) this decadent breakfast will leave you satisfied without that dreaded sugar crash. 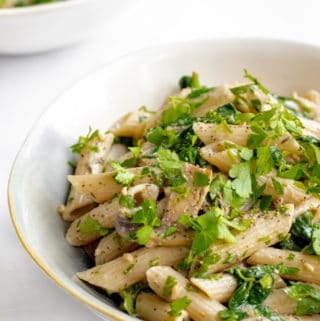 So I hope you love this recipe! It’s a fab one for the weekend and will most definitely impress whoever you may choose to share it with. Lucky them! Please let me know if you make this by sending me a picture on IG @georgieeatsuk, or leaving me a comment down below. Keep smiling! 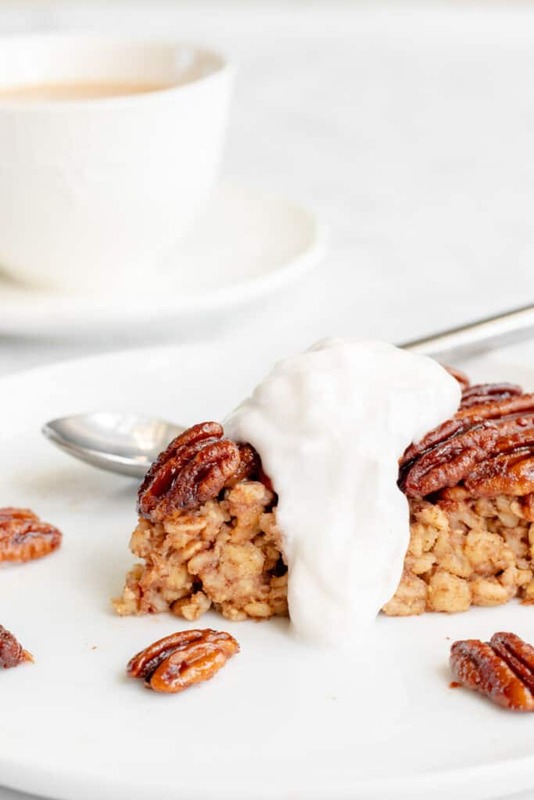 Baked oatmeal topped with sweet sticky pecans and a dollop of tangy yoghurt. 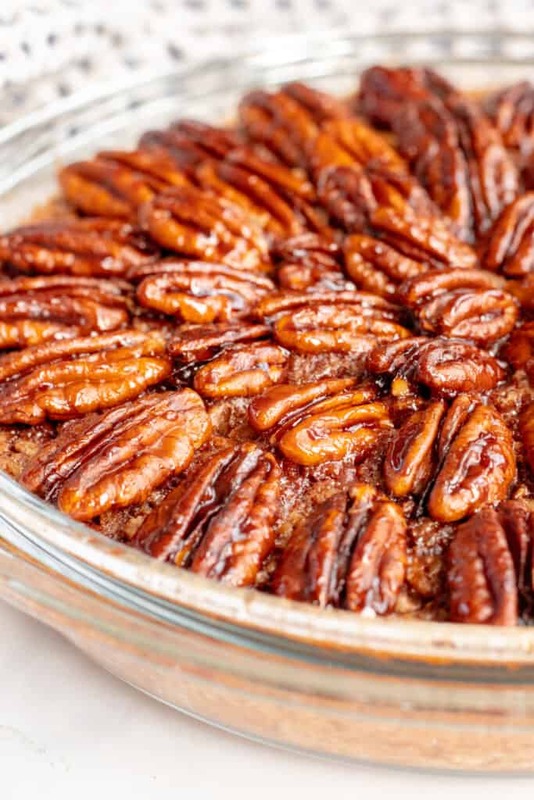 This ode to pecan pie is an impressive weekend breakfast that is sure to impress. Healthy, GF & vegan option. Mix all the baked oats ingredients together in a large bowl until combined. Pour the mixture into a small ovenproof dish and bake for 20 minutes. Meanwhile, make the topping. Add the coconut oil and maple syrup into a saucepan over a medium heat and stir until melted. Bring the mixture to a boil then add the pecans and salt. Give everything a good mix to coat all the pecans with the syrup then remove the pan from the heat. 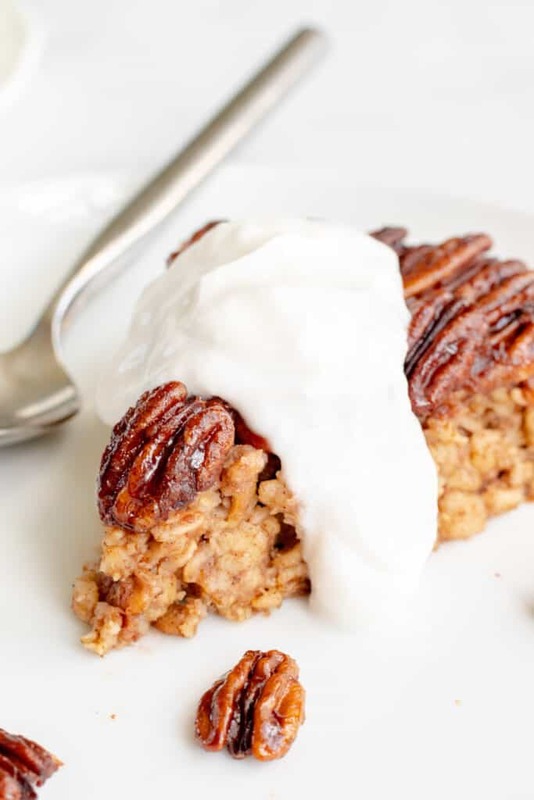 Remove the oats from the oven and pour/arrange the pecans on top of the half baked oats. Pour over any syrup remaining in the pan then return the dish to the oven for 10-15 minutes until golden brown around the edges. Divide the oats between two bowls and serve whilst still warm with a dollop of yoghurt. 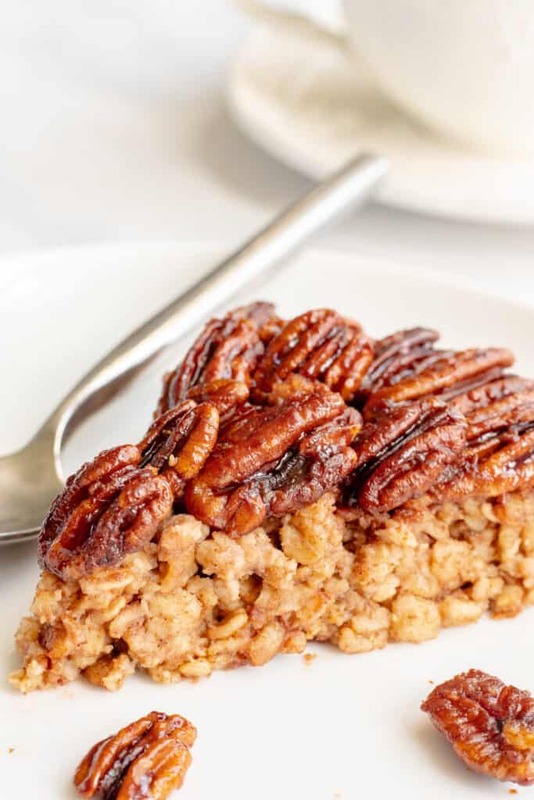 This pecan pie baked oatmeal is best served straight away, but leftovers can be kept in the fridge for a day or so and reheated in the oven or microwave. If you are short on time, you by no means need to arrange the pecans as I have done. Pouring them over the top will work just as well! 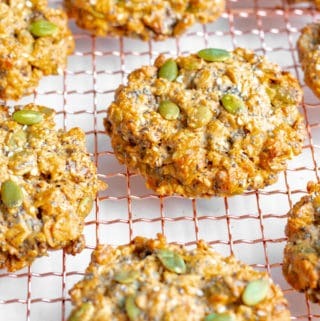 Gluten-Free: Make sure you are using GF certified oats and GF baking powder. Vegan: Use a flax egg. There is a great tutorial here. I have used rolled oats (sometimes called old fashioned oats) for this recipe as they are more substantial than porridge/quick cook oats. Although I am sure the recipe would still work with porridge/quick cook oats, I have not tried it to let you know for certain. Make sure you are using 100% maple syrup and not maple ‘flavoured’ syrup. You could also use raw honey or agave nectar if you prefer. 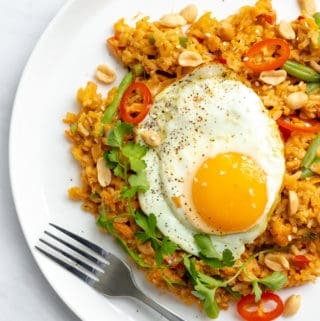 I love to top these oats with a dollop of coconut yoghurt. If you aren’t dairy-free greek/natural yoghurt also works well. If you loved this, then I am certain you will love my Carrot Cake Overnight Oat Recipe too! Hi Gerry, Im not quite sure what you mean I am afraid! 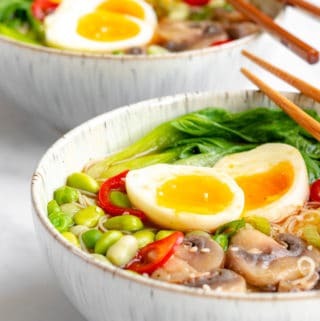 Send new recipes straight to my inbox!